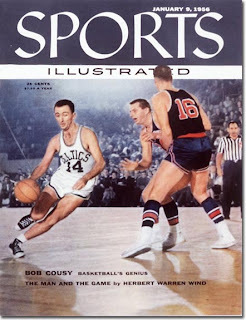 On January 9,1956 Bob Cousy became the 1st Celtic and first NBA player to be put on the cover of Sports Illustrated. The NBA was still a young league at this point and very low on the sports scale compared to where it would be later. Bob Cousy was the league's biggest box-office attraction and to get him on the cover of Sports Illustrated was very big for the league as some fans had a low opinion of basketball and basketball players. Bob Cousy was at this time recognized as the best player in the NBA, and Original Celtic and Knick coach Joe Lapchick claimed Bob Cousy was the greatest all-around player of all time. Cousy's Celtics were tied for 1st place in the Eastern Division at the time with a record of 16-9. Also receiving a feature article in this issue was Bill Russell who had just made his 1st appearance at Madison Square Garden with the University of San Francisco. Madison Square Garden was considered the mecca of basketball at the time and though Bill Russell was considered the best player in college basketball until Bill Russell showed it to the people at MSG he hadn't really proved nothing. Russell didn't disappoint the Garden faithful as he dominated future teammates Tommy Heinsohn and Willie Naulls. Bill Russell made believers out of the New York crowds. New England Sports Blog provides great coverage of the Celtics, Red Sox, Bruins, Patriots and more, including our Loose Change section. 24 year old from New York.